Well, I have to confess that there is a part of me that hopes so! But my title today is, at least to me, very obviously a spoof. People need to be careful about spoofs though. Sometimes they take on a life of their own. Consider Ivan Goldberg, a respected physician who specializes in treating individuals with mood disorders. He fabricated the term “Internet Addiction Disorder” in 1995. It was intended to be satirical, and he patterned his list of diagnostic criteria for the disorder after the entry for pathological gambling in the Diagnostic and Statistical Manual of Mental Disorders (“DSM”) — the authoritative work on psychiatric disorders published by the American Psychiatric Association. A copy of Goldberg’s parody can be found here. Perhaps it was the technical way it was written, or perhaps it was because it struck a nerve among those who sometimes feel widowed as a result of significant Internet use by loved ones, but the parody caught on. Some thought it was real — even a few serious and respected publications were fooled — and many people began to accept that Internet Addiction Disorder was legitimately recognized. In the fifteen years since Goldberg’s spoof, there has been increasing research on the effect of a variety of modern forms of technology on the human brain. One of the more interesting is the Starcraft study. Starcraft is a military science-fiction strategy game that has received enthusiastic accolades from those in the video-game industry, who have praised it as one of the best video games ever. The multiplayer version of it has gained particular popularity in South Korea. Because it is so good, a lot of people want to play it. And some of them spend a lot of time playing it. Of the eleven participants in a the study, six had dropped out of school for two months because of the amount of time they were playing Starcraft and two were divorced by their spouses as a direct result of the time they put into the game. Psychiatrists at the Chung Ang University in South Korea tested a treatment of this group by prescribing the antidepressant Bupropion for six weeks, resulting in their playing time decreasing by about a third. MRI studies of their brains by the Brain Institute at the University of Utah showed increased brain activity in three areas that was not present in a control group when shown images from the game. Many people remain dismissive of the idea that there can be such a disorder as Internet Addiction, and suggest that the treatment with an antidepressant works because those individuals were depressed — under that view, the excessive time playing Starcraft is a sympton of depression, not of a new type of disorder. They perhaps spend so much time playing in an effort to escape from the sadness that their depression causes. Known psychiatric disorders of obsession and compulsion are other likely candidates for disorders that are sometimes manifested by excessive Internet usage and game playing. In a decision in August of this year, the judge in the case, Alan C. Kay, dismissed some of the causes of action but declined to dismiss them all. The causes of action that remain, and which Smallwood presumably will now attempt to prove, include defamation, negligence, gross negligence, and negligent infliction of emotional distress. The full opinion (which considers a number of procedural issues at some length) can be read here. Although some commentators have ridiculed the decision, finding it stretches credibility to allow a cause of action to proceed on the basis of Internet addiction, it is worth noting that this ruling is still at a very early stage of the litigation. This was a ruling on a motion brought by the defendants, meaning that the plaintiff’s assertions were necessarily considered in their most favorable light and assumed to be true. Those claims that were dismissed — misrepresentation, unfair trade practices, intentional infliction of emotional distress, and assessment of punitive damages — were found by the court to have no merit even if all of the assertions were true and construed in that most favorable way. It is likely to be an arduous and uphill battle now to prove his assertions and to prevail on the surviving causes of action. Currently, Internet addiction is not a disorder recognized by the DSM and this is likely to be an important factor in the remainder of the litigation. It is also true, though, that some serious researchers advocate including Internet addiction in the next edition of the DSM, currently scheduled for release in 2013. This advocacy has been formal, appearing in prestigious peer-reviewed journals such as the American Journal of Psychiatry, but it still appears that those in the psychiatric-research community who advocate including it currently remain in the minority. The ultimate decision of the American Psychiatric Association will likely have a strong impact on litigation. Courts will take notice of such an expert assessment, whichever way it goes. If the next edition of the DSM includes Internet addiction as a disorder, expect to see many more lawsuits like those brought by Smallwood, and expect them to have a greater chance of success than currently seems likely. Also expect the producers of Internet content to respond and seek ways to avoid any liability. I’m putting myself out ahead of the curve. You’ve been warned. “Tomatoes May Be Dangerous to Your Health” was the headline of an opinion piece published on June 1, 1992 by the New York Times. In it, Sheldon Krimsky criticized the exemption of genetically engineered crops from certain levels of review by the Food and Drug Administration (“FDA”). He was referring to the Flavr Savr’ Tomato, the first genetically engineered food later to be granted a license for human consumption by the FDA. That species of tomato included engineered genes that were to slow the natural softening process that accompanies ripening. The idea was that the tomatoes could spend more time on the vine than other tomato species, producing more flavor, but still remaining firm enough to ship. Ever since Mary Shelley’s baron rolled his improved human out of the lab, scientists have been bringing just such good things to life. If they want to sell us Frankenfood, perhaps it’s time to gather the villagers, light some torches and head to the castle. The term caught on and many still continue to use it in referring to food produced from genetically engineered crops. The reality is that humanity has been engaging in a form of genetic manipulation of crops even since the earliest days of agriculture, but such processes were a result of selective breeding rather than through direct manipulation of genes. Consider the case of milk production, for example. As a result of identifying bulls who have highly desirable genes, the number of bulls that are used to sire dairy cows is astonishingly small, resulting in a very narrow range of genetic diversity among cattle in the dairy industry. At the time of his death in 1997, for example, the Dutch Holstein Friesian bull named Sunny Boy had sired some two million calves. The impact on the genetic origin of dairy products throughout the world was a direct result of human intervention in natural processes. Or consider the production of soybeans. In the 1990’s, the entire soybean crop in the United States — some 60 million tons — was descended from a mere dozen soybean strains that had been collected in northeastern China. Since the FDA approved human consumption of the Flavr Savr’ Tomato in 1994, there has been a huge infiltration of genetically modified crops into the food supply, especially in the United States where more than 90% of the soybean, cotton, and canola markets are supplied by genetically modified crops. Byproducts of those crops — notably soy lecithin — are found in thousands of processed-food products: chocolate bars, baby foods, margarine, breakfast cereals, and many others. This week, the FDA is conducting hearings as part of its consideration whether to allow human consumption of AquAdvantage, a genetically modified species of Atlantic salmon that some are — inevitably — calling a frankenfish. 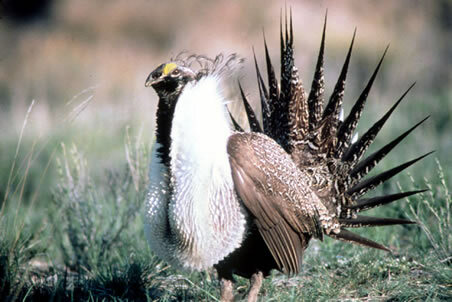 The application was submitted to the FDA in 1995, but the agency has so far never approved any genetically modified animal for human consumption. AquAdvantage has been modified so that it grows twice as fast as its natural counterpart. 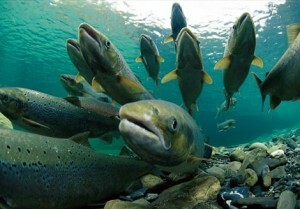 Critics have expressed two concerns: that the effect on people who consume the fish is unknown and that if the genetically engineered fish escapes, it may have a negative impact on the natural salmon population. These concerns are not frivolous ones: salmon populations are already depleted because of overfishing, and if the genetically modified fish grows at twice the speed as naturally occurring salmon, there is a possibility of disrupting the food supply for natural salmon populations. It can be difficult to predict all of the effects of genetic modification of organisms. For example, there is a known history of genetically modified plants producing substances they hadn’t produced before or of repressing the production of substances they normally produce: transgenic potatoes that were supposed to make more starch and less sugar did the opposite; transgenic tomatoes that were made to produce excess carotene became unexpectedly smaller; and perhaps most notably, reproduction mechanisms of some plants changed so that inserted genes unexpectedly started appearing in other plant species. Surveys confirm that there is generally a strong desire by people in the United States to have food labeled as arising from genetically modified organisms, something that the FDA has never required. Industry interests in the United States generally oppose labeling — jurisdictions elsewhere in the world where labeling is required, notably the European Union and Japan, find almost no one willing to buy food derived from genetically modified organisms. The FDA has taken the position, however, that federal law, when properly construed, actually prohibits the agency from requiring labeling of food derived from genetically modified plants. The relevant law that the FDA cites is found in the Food, Drug, and Cosmetic Act (21 U.S.C. §343) and prohibits a variety of food labeling that is “false” or “misleading.” The FDA has concluded that because it has generally found food derived from genetically modified sources not to be “materially different” than food derived from natural sources, it cannot require labeling, and this position has been upheld in court: Alliance for Bio-Integrity v. Shalala, 116 F.Supp.2d 166 (D.D.C. 2000). Producers of genetically modified food are permitted to add labels if they wish, but none do. It seems likely that AquAdvantage will be approved for human consumption in due course. One of the objectives of the hearings is to determine whether the FDA’s position on labeling should be different because this is an animal to be consumed rather than a plant. Some background material on the labeling issue prepared by the FDA can be read here. 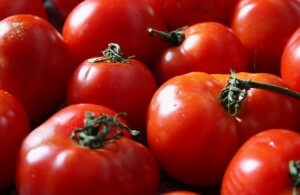 It was only three years after the release of the Flavr Savr’ Tomato that its producer Calgene needed to withdraw it from the market. They were sold under the brand name MacGregor’s in California and a few places in the Midwest of the United States. But they turned out to be more delicate than expected, bruising easily so that special trucks were needed for transportation. Delivery of the tomatoes to grocery stores became prohibitively expensive. Perhaps AquAdvantage will be no more successful in the end. But whether it is approved soon by the FDA or not, it is clear that consumption of such animals is a genie that will soon be out of the bottle and very unwilling to get back in. The story alluded to by my title is apocryphal, but the full account of Galileo’s trial before the Holy Roman Inquisition is a matter of historical truth. Although he is sometimes mistakenly credited with the invention of the telescope, Galileo’s real contribution is to have used telescopes for celestial investigations. He was about 40 years old when he learned of the Dutch invention and decided to build his own, pointing it at the moon, the stars, and the Sun. He was the first to observe sunspots and their movement as they revolve with the Sun, conclusive evidence that prior teachings that the Sun was a perfect unchanging sphere were incorrect. He was the first to see the moons of Jupiter and to witness their revolution around that planet, calling into question prior teachings about the perfection of the planets. And perhaps most signficantly, he observed the crescent of Venus. This was critically important because the fact that Venus has celestial phases when observed from the Earth implies motion about the Sun. A heliocentric model of the solar system in which the planets revolve about the Sun had been put forth many decades earlier by Nicolaus Copernicus. Galileo had expressed private support for that theory as early as 1597, but remained hesitant about making his views public because of the consequences Copernicus had faced: “I have not dared until now to bring my reasons and refutations into the open, being warned by the fortunes of Copernicus himself, our master, who procured for himself immortal fame among a few but stepped down among the great crowd.” It was Galileo’s observations with the telescope that finally emboldened him to make his views public. After all, anyone could take a telescope like he did, point it at the sky, and see the same conclusive evidence with their own eyes. Galileo’s publications began to assert the heliocentric nature of the solar system openly, notably in his Letters on the Solar Spots, which attracted the first attack from the Church. Only the Aristotelian model could be correct, the Church asserted, because a heliocentric model was contrary to scripture. Galileo’s writings were brought to the attention of the Holy Roman Inquisition by members of the clergy. Things escalated, with more pressure being brought against Galileo to recant as he resolutely maintained that they should simply take a telescope and look for themselves rather than be shackled by doctrinal belief. In 1623, Galileo had six private audiences with the Pope, resulting in a compromise: Galileo would write a book, presenting both views — hauntingly familiar to the demands we see today to present “both sides” of an issue even when there is no real scientific controversy. His book, Dialogue Concerning the Two Chief World Systems, would be fateful. 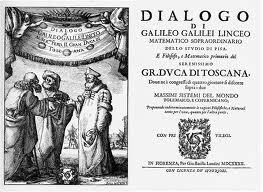 Written as a dialogue among three people, Galileo cast Simplicio, a pompous fool, in the role of defending the Aristotelian model and presenting the view of the Pope. He was arrested and tried for heresy by the Inquisition. Under threat of execution, he recanted the Copernican theory so that he could live the remainer of his life under house arrest. But he is said to have uttered “Eppur si muove!” when he was sentenced — “And yet it moves!” There is no real historical evidence that he said it, and the reality is that he was very probably broken by the experience. Nonetheless, we romantically admire the defiance of a man with such conviction in the conclusions of his observations that he would maintain them against action so strong that it took his persecutors almost four hundred years to finally acknowledge his mistreatment, still centuries after his ideas became commonplace. While of course not rising to the level of the Galileo affair, the Commonwealth of Virginia has recently been engaging in activity that raises far too many questions about its motivation. The Attorney General of Virginia, Kenneth Cuccinelli, was unsuccessful this week in his attempt to subpoena records from the University of Virginia as part of a fraud investigation into a grant supporting the research of Michael Mann. Mann is a climate researcher who has — for reasons that can only be characterized as bizarre — become a focal point of efforts to discredit research that suggests human activity is causing global climate change. I previously wrote about Mann and his exoneration in the “Climategate” allegations here. The principal reason that the actions of Virginia are concerning is that the Attorney General has such little basis to support his actions, raising significant questions about his true objectives. In April, he issued a civil subpoena demanding that the University of Virginia produce a swath of documents relating to Mann’s receipt of funds to support his research, including ten years of correspondence involving Mann and more than 40 other climate scientists. The University resisted, noting the chilling effect that can result on academic freedom when private correspondence is baselessly subject to government review. There is controversy over Mann’s conclusions. A small amount of this controversy is scientific, questioning his methodology, and deserves to be explored. Unfortunately, most of the controversy surrounding Mann’s work has been generated by nonscientific interests who appear simply to dislike his conclusions and who are willing to intrude on the scientific process in a way that can inhibit scientists from publicizing their ideas. The proper avenues for resolution of the scientific controversy are the time-honored approaches that scientists have developed — publication, peer review, and debate. Academics expect their research to be subjected to that scrutiny — and that scrutiny is ideally intense — but they also need to be able to interact with others in exploring initial thoughts, suspicions, and hypotheses without fear that every incomplete idea may be demanded by the government and examined out of context. In the abstract, scientific misconduct is a legitimate concern, but there still needs to be something that can be identified to justify an investigation beyond the fact that some research is controversial. Otherwise, and as amici who filed briefs in the case correctly noted, “[s]eeking to avoid the stigma (not to mention legal costs) involved in a fraud investigation, professors would hesitate to research, publish, or even teach on potentially controversial subjects.” And controversy is, in many ways, what drives scientific innovation fastest. Monday’s ruling by Judge Paul Peatross notes that “[w]hat the Attorney General suspects that Dr. Mann did that was false or fraudulent in obtaining funds from the Commonwealth is simply not stated…. [I]t is not clear what he did that was misleading, false or fraudulent in obtaining funds from the Commonwealth of Virginia.” The complete ruling can be read here. The Attorney General now has the opportunity to reframe his subpoena and articulate specific allegations if they exist. 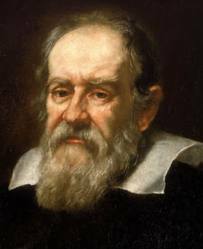 It is often noted that Galileo died the same year that Isaac Newton was born. Newton, of course, would go on to invent a considerably better telescope design and to develop the theory of gravitation, which decisively confirmed the Copernican model of the solar system that Galileo espoused. How our understanding of global climate change will develop in the years to come remains unclear. But one thing is certain: it will not advance at all if scientists are intimidated into suppressing their conclusions.